Australian Switchgear Manufacturer NOJA Power today is presented with the Quality Management System 15 Year Silver Award by SCI Qual International. Delivered in recognition of an ongoing commitment to an improved Quality Management System (QMS) over a continuous 15-year period. NOJA Power is celebrating this special milestone in the growth and maturity of the company. This achievement required the cooperation and commitment from all NOJA Power staff. NOJA Power now joins a very select club of businesses that have achieved this 15-year QMS milestone. The key deployment strategy demonstrated by NOJA Power has been a proactive stance on adoption of new standards. 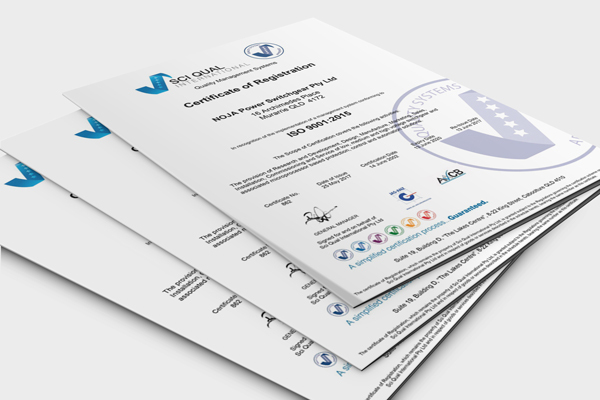 With the latest iteration of ISO 9001-2015 deployed and accredited at NOJA Power within the year of release, the benefits of the system have been clear for the organisation. The 2015 standard advocates risk based thinking throughout the standard, encouraging the management system within the manufacturing organisation to encourage continuous improvement. The mantra of continuous improvement has resonated well with the founding team at NOJA Power, as they are dedicated to improving the performance of electrical switchgear products in adverse and harsh environments around the world. “NOJA Power uses its Quality System to drive continuous improvement in the quality of the products and services we deliver to our customers,” reports NOJA Power Group Managing Director Neil O’Sullivan. Founded in 2002, NOJA Power is an Australian manufacturer of Medium Voltage Electrical Switchgear with a focus on Safety, Reliability and Environmentally Friendly values. 2017 marks the 15th anniversary of the firm’s operations, and the Quality Management System has been a core process for the continuous growth and improvement of the business. NOJA Power has also deployed the ISO standards for environmental management (ISO 14001) and OH&S (ISO 18001). As a critical infrastructure manufacturer, NOJA Power is held to stringent quality demands to ensure reliability in the field. Power outages are events with major economic consequences, and NOJA Power adheres to industry best manufacturing quality practices to secure the best possible reliability for its customer base. The NOJA Power OSM Recloser with RC Cubicle product is deployed in large volumes around the world, designed to protect and control the electricity system. NOJA Power’s products are in service in 86 countries worldwide today, deployed to provide energy reliability, security and safety to Distribution Utilities and large industry.